I am obsessed with scallops. Don’t get me wrong, I LOVE bacon wrapped scallops, but they are so much more, even without bacon. I consider scallops a rare treat, as they can be quite expensive, so I tend to buy them when Mike is out of town because I just don’t want to share (#Sorrynotsorry). Scallops are also quite fickle to cook. They can turn quite rubbery if over cooked, but when done right they will absolutely melt in your mouth. This is my go-to method for cooking scallops. If I’m feeling adventurous, I add a sauce (White wine burre blanc anyone? We’ll cover that another day), but most of the time I just eat them as is. 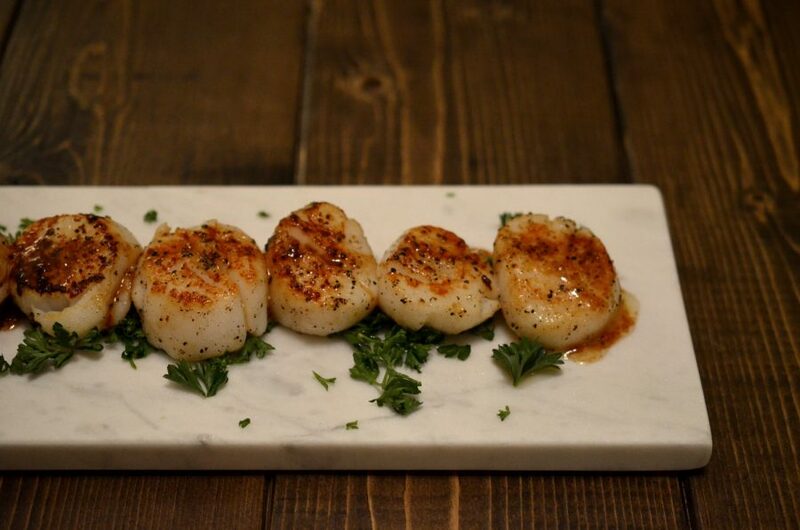 *Scallops come in many different sizes – try to find bigger scallops (around 1 1/2 inch diameter) as they are easier to not overcook. Meanwhile, rinse the scallops (be thorough about washing, it’s a bummer when you bite down on sand) and pat them dry with paper towel. Sprinkle both sides with salt, pepper and sugar. Once the oil is hot, it should glisten and be very runny, add the scallops to the pan. Sear 1 1/2 to 2 mins a side (depending on thickness). Remove from the pan immediately and serve.